Just as the name implies, SHELTON CHASTAIN is the pairing of two major players from within the history of heavy rock, Mark “The Shark” Shelton and David T. Chastain. Guitarist Mark Shelton was a founding member of the legendary metal band Manilla Road, who unfortunately passed away in July of this year. Fellow guitarist David T. Chastain is an iconic figure that rose to prominence in the mid-80s, both as a solo artist and within such bands as CJSS, Spike, and Georgia Blues Dawgs, among others. He may be best known for his work in the band that bears his name, Chastain, with singer Leather Leone. At the time of Shelton’s passing, he was involved in a variety of projects, both happening and future-planned. Mark was particularly focused on seeing a specific one of these realized, his late Eighties collaboration with David, under the SHELTON CHASTAIN moniker. Although the duo did get together and record several songs at the time, they never imagined that it would take three decades to get the material released. Yet, released it is… finally! 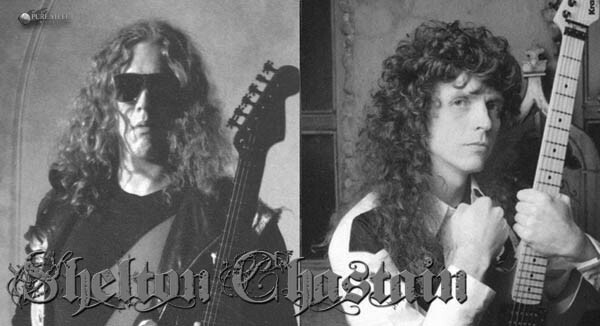 SHELTON CHASTAIN‘s ‘The Edge Of Sanity – 88 Demo Session‘ has arrived from Leviathan Records. Though the tracks are in their demo style format, with audio quality that may not be up to today’s label studio standards, the significance of these compositions cannot be overstated… nor are they lacking when it comes to their being fantastic songs in general. They are best described as traditional heavy metal or “classic metal”, music that contain incredible guitar works from both musicians, and vocals from Mark Shelton. Check out the ‘The Edge Of Sanity – 88 Demo Session‘ artwork, track-list, and credits below, along with an official video for the song “The Edge Of Sanity“. Purchase this release HERE. All selections written by Mark Shelton and David T. Chastain. Vocals recorded at Midgard Sound Labs in Wichita, KS. All other recording, mixing and mastering at Leviathan Records Studios in Cincinnati, OH and Atlanta, GA. Cover artwork by Rainer Kalwitz – Logo by Piotr Szafraniec – Other artwork created by Steven Taylor. Produced by Shelton Chastain.